Jeremy Clarkson tags Detroit as "drugs, violence, murder, terror"
Do we pause to take note of Top Gear's Jeremy Clarkson calling Detroit a city full of "murder" and "terror"? Yes, yes we do. But do we get angry, upset or lash out? No, we have something better. So soon everyone will move out to the suburbs, where the car is allowed and you end up with a doughnut. A ring of wholesome goodness surrounding the square root of nothing at all. You end up with Detroit. Drugs, violence, murder, terror. The end of days. Now we know Clarkson is a fan of certain things from Detroit. 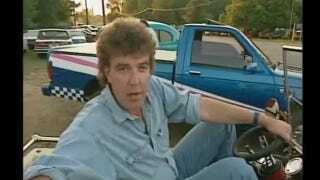 Back in 1995, he even hit the town with his favorite rock and roll singer Bob Seger for his old "Motorworld" show, seen here checking out the drag race scene on Telegraph in his best Jay Leno costume. Obviously his words have some truth; Detroit has suffered from an exodus that we were criticized for noting — which subsequently turned out to be growing faster than expected. But still: Detroit is much more than the square root of nothing, and it's a city worth rooting for. So: Every time Jezza pokes at Detroit, we'll rerun his starring role in this 1993 music video for Mr. Blobby's theme song, a British children's character whose tune was voted the most annoying Christmas song in the history of music by British listeners. Everybody has a past they're trying to put behind them.